What happens when an Ould Wagon moves from the South of Ireland to the South of France with horses, dogs and a Long Suffering Husband! I have a soft spot for Apt. In the summer, it's buzzing with of tourists, but in the winter, it's a sleepy country town that only comes alive on a Saturday morning, when the market takes over the whole town. The N100 runs through it, en route from Avignon to Forcalquier, and parallels the river Calavon, which also pass through the town. On one side of the Calavon, the buildings are practical, commercial, almost industrial. 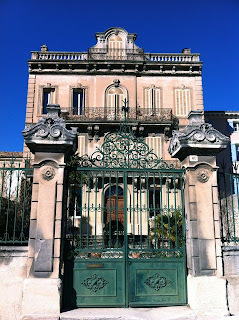 On the other side, faded old villas snooze in the winter sun, shutters closed against the cold. This was where we headed today - the Auberge le Luberon, a traditional hotel and restaurant, which looks across the Calavon to the business district of Apt. We chose the Auberge le Luberon on a whim - we had parked in the nearby "submersible" car park (it's a car park that's prone to flooding if there's heavy rain, there are warning signs all over the place, apparently it can flood in a mere twenty minutes!). Not knowing what to expect of the Auberge le Luberon, we were pleasantly surprised to find a welcoming reception area and a small, bright and nicely decorated dining area which opened onto a terrace. There was a neatly pruned platane (plane tree) at the side of the terrace, which must give very welcome shade in hot weather and we immediately said "This must be lovely in summer, we'll have to come back!" Our first impression was that it was definitely a bit posh, but actually, the menu wasn't a ridiculously posh price at all! 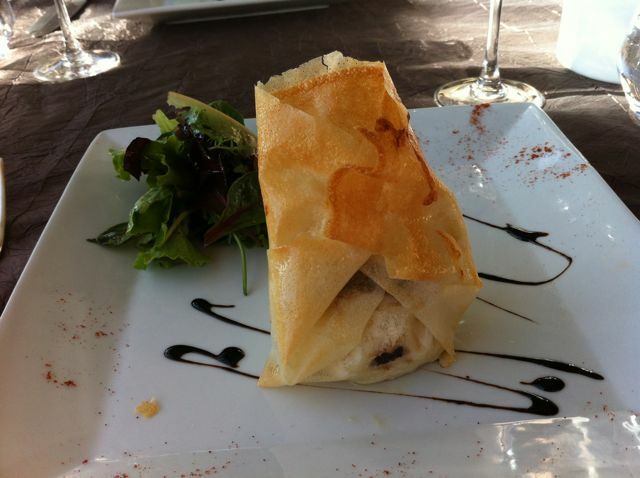 We both had the same starter, Feuillette de Chèvre and Tapenade - goat's cheese and olive pâté wrapped in filo pastry, with a little salad on the side. It was nice except it could have done without the tapenade - it was too salty and clashed with the goat's cheese rather than complemented it. Hmm. Ok so far, how were the main courses going to be? 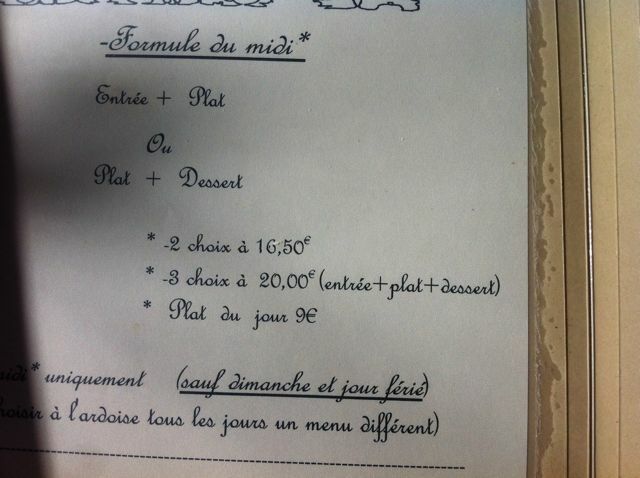 Going with the Menu du Jour, we had a choice of Duck Confit or Salmon. I went for the Duck and the LSH went for the Salmon. 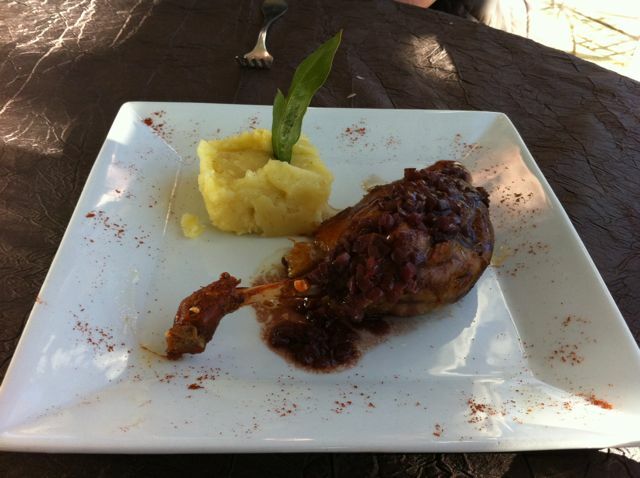 Both came with a little square of mashed potato, with a bay leaf sticking out of it at a jaunty angle. The duck had a garnish of choucroute/sauerkraut made with red cabbage, which gave made a nice contrast to the fattiness of the duck. 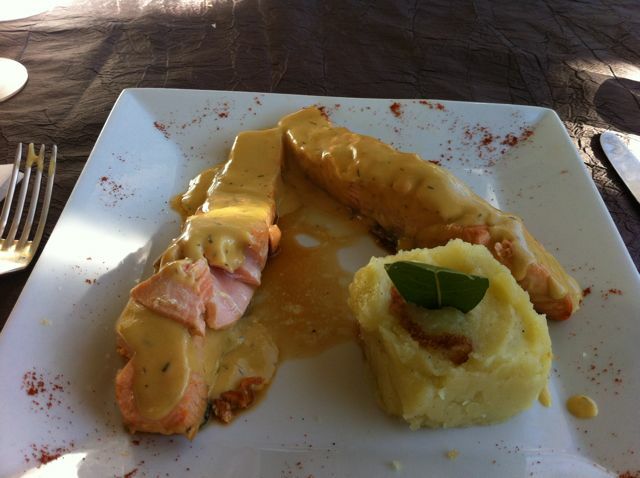 The salmon was dressed with a slightly mustardy sauce, with the LSH felt was superfluous. The salmon was cooked to perfection - not an easy thing to do - and he thought it would have been perfectly fine on its own! He still had room for dessert - Chocolate Mousse Cake! 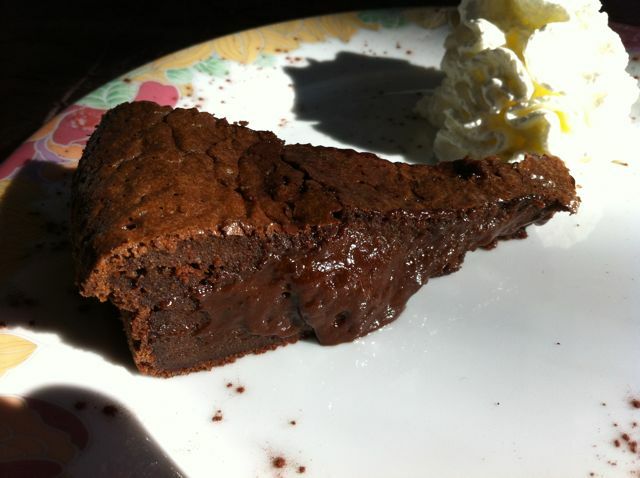 It looked amazing - the gooey inside oozed out when he broke into it with his fork, I wish I could eat chocolate! 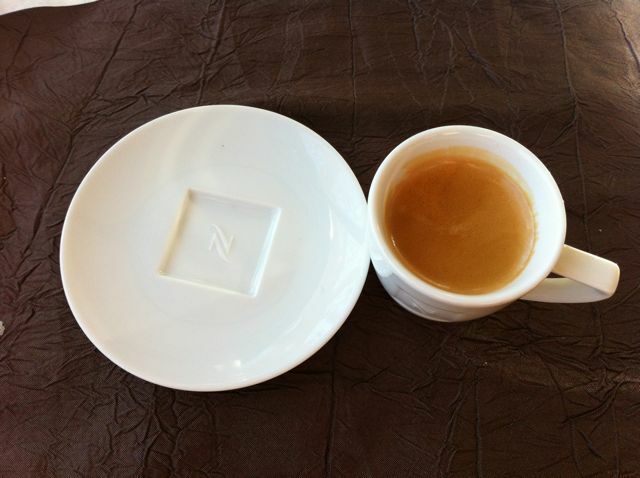 I had to settle for coffee. Go on, you feel sorry for me, admit it! It was a really good meal, very well cooked and presented, but in our humble opinion, the chef could have toned down on the contrasting accompaniments a bit - less would be more! Value wise, pretty good for town dining in a place with a "posh" ambiance. We'd be very happy to take visitors there any time we're looking for lunch in Apt. It all looks delicious. I could have gone for a piece of that cake, looks yummy. I very much like the architecture on your favorite house in Apt. Wonder what it's like inside. I love comments - I may not reply to them all, but I surely read them all! Apologies for introducing Comment Moderation, but I've been getting some strange hits recently and I want to reserve the right to control what gets posted here. A Final Plea for Votes! A blizzard, a chimney fire, then spring sneaks around the corner. Injecting some sun on a August day!! Page 3? who should feel exposed? What Kind Of Goose Is That? Irish by Birth - Munster by Grace of God!